Dr. Schubert is one of only two practicing orthodontists in the Park Cities who are Diplomates of the American Board of Orthodontics, demonstrating judgment, skills and knowledge required for the highest level of excellence in Orthodontics. This is a distinction that only one in every three orthodontists achieve. Dr. Schubert had the privilege to train at the orthodontic department at the University of North Carolina under Dr. William Proffit. This program is regarded as one of the best in the nation and one of the best in the world. Dr. Schubert is one of very few orthodontists in Dallas/Park Cities to be voted by their peers “Best Orthodontist” for 2007, 2015, 2016, 2017, 2018 as published in D Magazine. Our practice uses only the highest quality braces in function and estetics, with incredibly low profile and minimal overall size. Our practice uses the most current cutting-edge technology available. We are 100% digital, making our practice state-of-the-art. Our iTero scanner eliminates the need to take impressions, except for same-day retainers. Dr. Schubert has one practice location and lives in University Park. This allows her to be available for her patients at all times, offering appointments Monday through Friday and we offer same day emergency appointments. 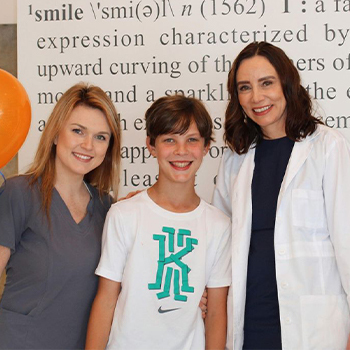 Dr. Schubert is the only orthodontist in the practice and therefore all patients are treated exclusively by her. Dr. Schubert personally places all appliances and braces herself. We believe in the benefits of a smaller boutique like practice, which enables us to pay close attention to our patients’ needs and provide them with superior service. Our office is conveniently located in Preston Center, with front door parking available. We offer an environment that is tranquil, beautiful, professional, clean and modern. All our staff is carefully selected and highly qualified in the treatment and care of our patients. We are compassionate and treat each and every one of our patients as we would treat our own family members!